Chatauqua Park, located at 720 N Junior Ave, also offers a wide range of activities. A small t-ball diamond with a concession stand along with a small playground are located at the north end of the park. Scattered throughout the park is the 12 hole frisbee golf course. By the Shelter House toward the south end of the park, you’ll find a sand volleyball court and several horseshoe pits. There are also several picnic tables throughout the park providing nice areas for your picnic lunch or dinner. The Shelter House is available for rent. Drone footage courtesy of Hayden Baldwin. 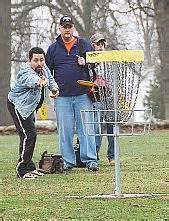 **DON’T FORGET…… each year, over Labor Day weekend, Chatauqua Park is the site for the Frisbee Golf Tournament and the Annual Hog Wallow (mud volleyball) sponsored by the National Guard.